i've started to read the book Empires of the Indus: the story of a river. I found the book when I was cleaning my room and decided to look at our family bookshelf. there were a lot of cool looking books there, and this is the first one i chose to read. I'm not really sure what i'm reading about (and i haven't even read chapter one, just the preface), but it seems like a really interesting book and i'm kind of excited to read it. I'm not even sure what the Indus is yet because the author never said what it was, or I wasn't focusing while i was reading it. i'll see if it says anything. From what i've read, the book is probably going to be about the history of Indus and/or what the author experienced and learnt in her two years of living in Delhi. I've only read the preface, and i've already read so much that i'm confused. I think I'll need to stop and think about what I read a lot. When I was reading, I sort of thought of when my mum used to read the History of the World series to me, and I learnt a lot. maybe I should continue those (if there are any left) by myself or with my brother, since she is busy a lot now. I miss reading The History of the World to you! We only read 2 books. There are FIVE in the series we have, because, well, history is pretty long. Susan Wise-Bauer is a dynamic writer. I also miss reading the Grammar series, with all its weird bits! I also forgot to add, I just bought A Passage to India by E.M. Forster. I love books about Indian history. 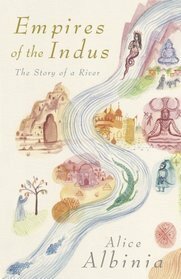 I like the way you have made a blog post about A book could A Book About The Empires of the Indus: The Story of a River. What inspires you to read a book like this ? Why did you pick this book ?